Popular sizes: 2" x 3.5", 2" x 2", and 3" x 3"
Foil hang tag printing gives your tags a little something extra without overpowering other elements in your designs. Use them for luxury items to highlight their value, or with any product offer to increase your brand image. The metallic tones on foil hang tags give off an industrial vibe that can also go well with tech branding. Print foil hang tags to give your offers a touch of class. 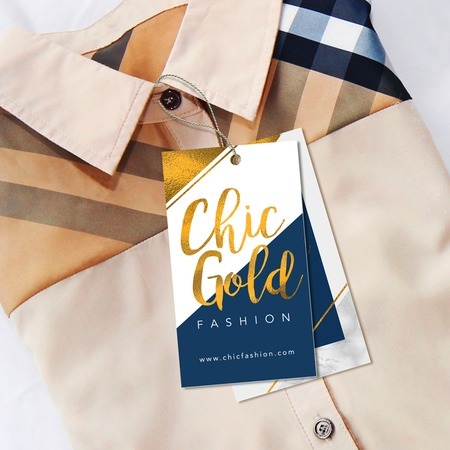 These metallic hang tags are available in your choice of gold, copper, or silver foil. UPrinting also offers printing on one or both sides, which gives you the option of leaving one side blank depending on the type of impact you want to make. Contact us to learn more about foil hang tag printing and further customization options.